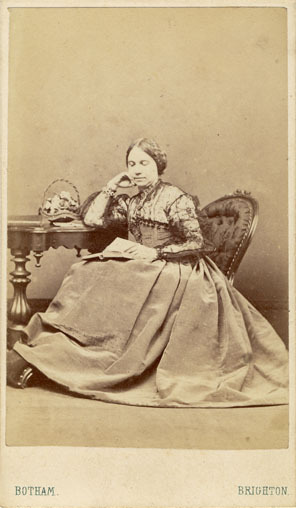 [ABOVE] A portrait of a woman seated at a writing desk and holding a book, photographed by Benjamin William Botham of 43 Western Road, Brighton (c1864) Negative No.4276 [ABOVE] A portrait inscribed "Mrs Etherton, West Street", photographed by Benjamin William Botham of 43 Western Road, Brighton (c1864) Negative No.3541 E. [ABOVE] The reverse of the carte-de-visite portrait of "Mrs Etherton," (pictured left), showing the written inscription and the trade plate used by the photographer Benjamin William Botham during the mid 1860s. 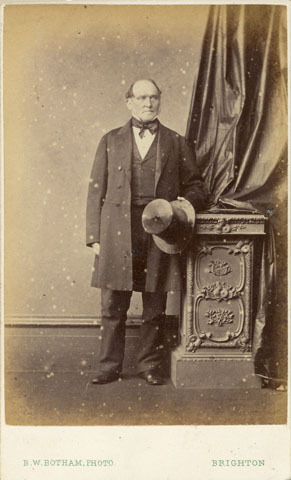 [ABOVE] A portrait inscribed "Mr Etherton", photographed by Benjamin William Botham of 43 Western Road, Brighton (c1864). 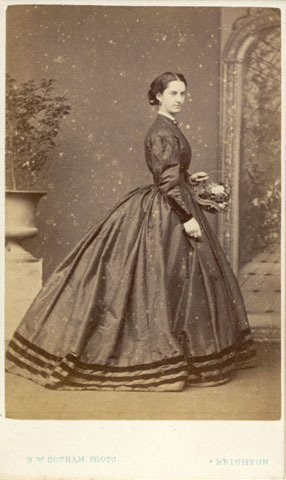 Negative No.4055 E.
[ABOVE] A portrait of a young woman holding a basket of flowers, photographed by Benjamin William Botham of 43 Western Road, Brighton (c1865) Negative No.5631 D [ABOVE] A hand-coloured portrait of a Louisa King (born c1825), youngest daughter Edward King and Constant Clayton Crole [daughter of Rev. 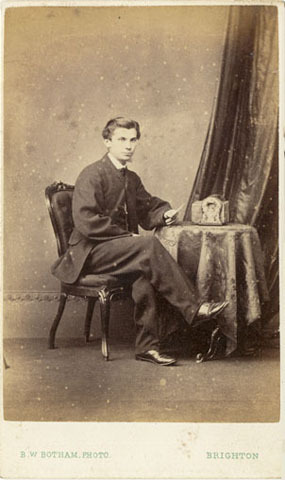 Anthony Crole], photographed by B. W. Botham of 43 Western Road, Brighton (c1867). Negative No.7328 K. [ABOVE] The trade plate used around by 1867 by Benjamin William Botham, artist photographer of 43 Western Road, Brighton. Negative No.7579. 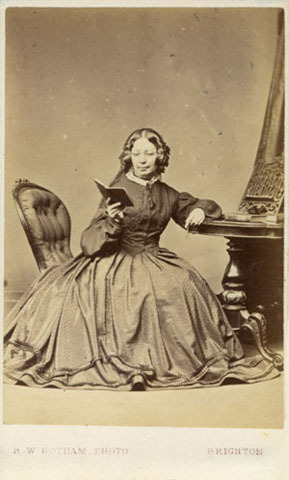 [ABOVE] A portrait of a seated woman reading a book, photographed by Benjamin William Botham of 43 Western Road, Brighton (1867) Negative No.7579. 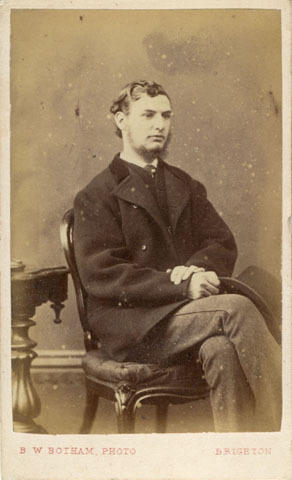 [ABOVE] A three-quarter length portrait of a seated man holding a hat, photographed by Benjamin William Botham of 43 Western Road, Brighton (c1868). Negative No. 8408 [ABOVE] The trade plate used around by 1868 by Benjamin William Botham, artist photographer of 43 Western Road, Brighton. Negative No.8326. 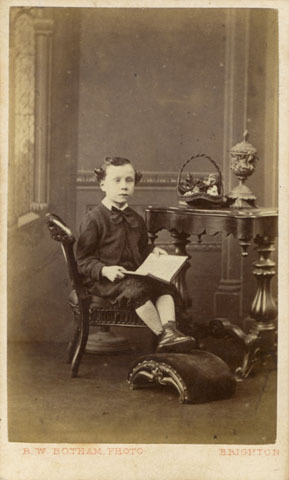 [ABOVE] A portrait of a seated boy man holding a book, photographed by Benjamin William Botham of 43 Western Road, Brighton (c1868). Negative No. 8326. 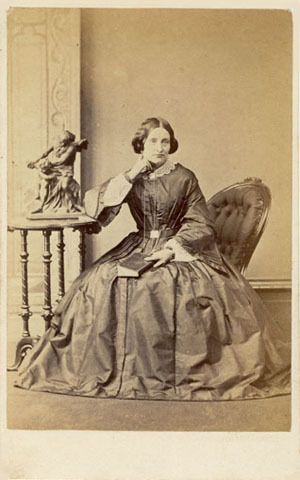 [ABOVE] A portrait of a seated woman holding a book on her lap, photographed by Benjamin William Botham of 43 Western Road, Brighton (1867) Negative No 7944. 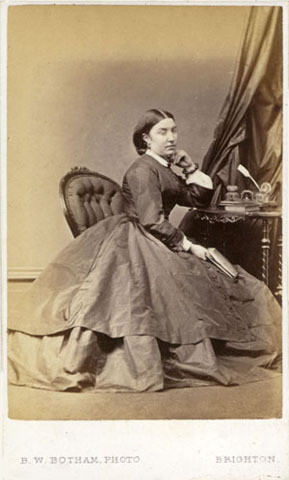 Benjamin William Botham began his photographic career around 1856. 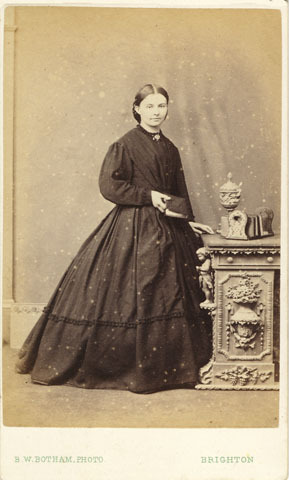 Between 1856 and 1860, Benjamin Botham worked as a travelling photographer in Derbyshire and elsewhere. 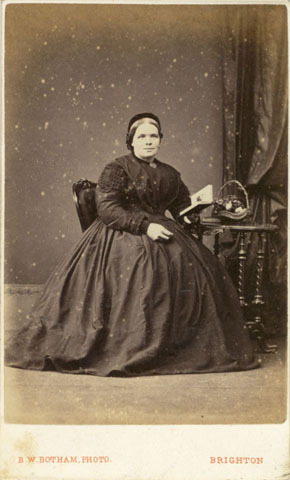 By 1861, Benjamin Botham had settled in the Sussex seaside town of Brighton and had taken over a photographic portrait studio at 59 North Street, Brighton. 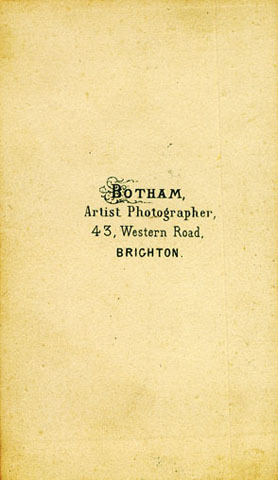 Around 1862, Benjamin Botham had acquired a new photographic studio at 43 Western Road. 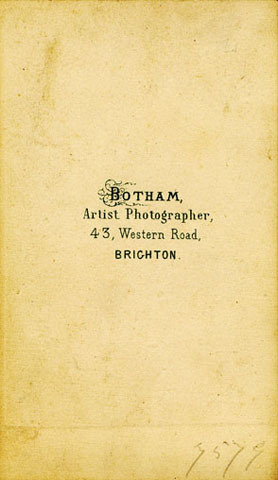 Botham worked as a portrait photographer at 43 Western Road, Brighton from 1862 until the Summer of 1868, when he gave up photography to become the proprietor of the New Oxford Music Hall in New Road, Brighton. 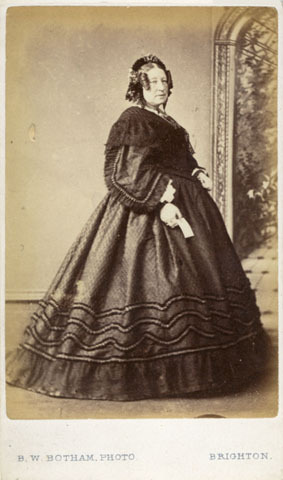 During his photographic career in Brighton, which spanned the years 1861 to 1868, Benjamin William Botham produced "nearly 10,000" negatives. 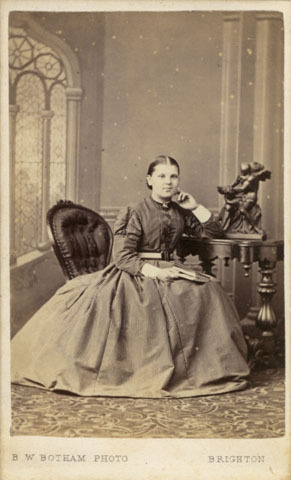 Botham's early photographic registers probably identified particular photographs by the sitter's name instead of a negative number. From around 1862, negative numbers (from No. 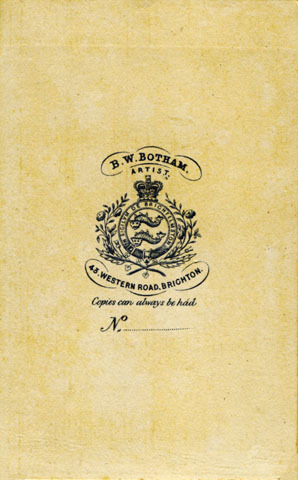 2,000 upwards) appear on the reverse of cartes-de-visite produced at B. W. Botham's studio at 43 Western Road, Brighton. 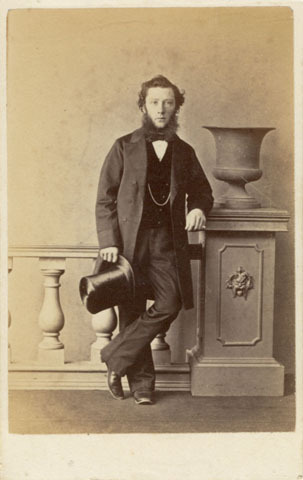 Around 1866, Botham changed the design of his trade plate (see Fig.3) and cartes produced around 1867 carry negative numbers that range from 7,000 to 8,000. 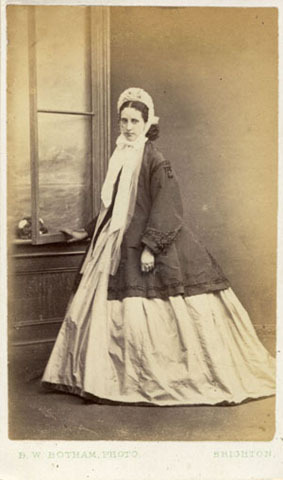 Cartes carrying a photographic negative number of above 8,000 were probably produced during the period 1867-1868, Botham's final year in business as a portrait photographer. Fig 1. 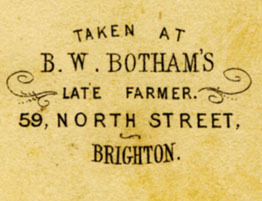 Benjamin William Botham's trade plate used during his tenure at 59 North Street, Brighton. 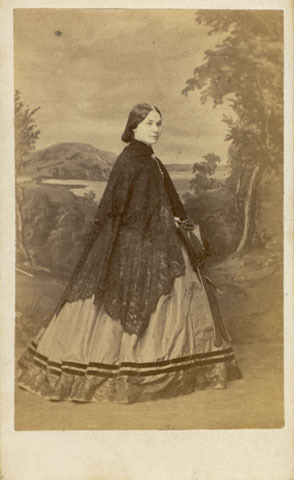 (1861). 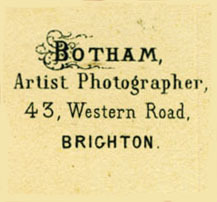 Around 1862, Botham moved to a new studio at 43 Western Road, Brighton. Fig 2. 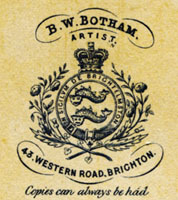 B. W. Botham's trade plate printed on cartes issued from 43 Western Road, Brighton (1862-1866) Fig 3. 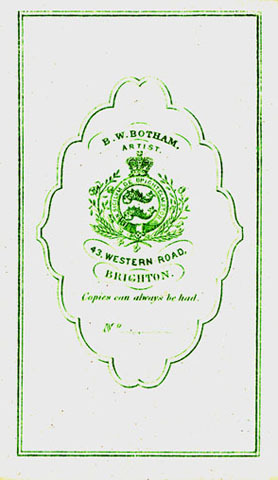 B. W. Botham's simplified trade plate which appeared on cartes produced at 43 Western Road between 1866 and 1867. 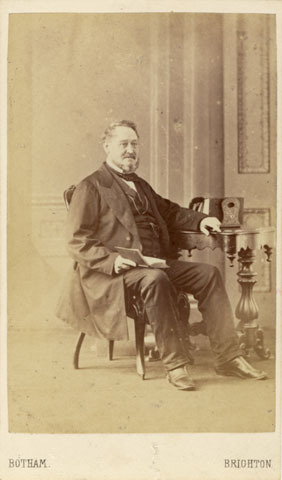 [ABOVE] A portrait of a seated man holding a book, photographed by Benjamin William Botham of 43 Western Road, Brighton (c1866). The trade plate on the reverse is illustrated on the right. 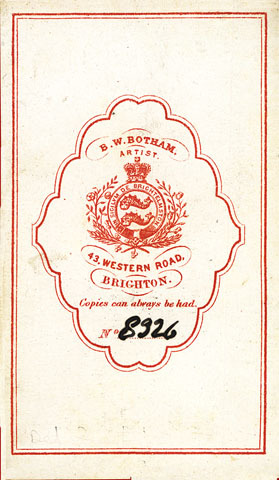 [ABOVE] The simplified trade plate design printed on cartes produced at B. W. Botham's studio at 43 Western Road, Brighton between 1866 and 1867. 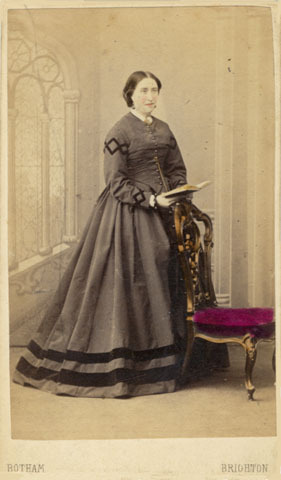 [ABOVE] A portrait of a woman photographed by Benjamin William Botham of 43 Western Road, Brighton around 1867. The trade plate on the reverse is illustrated on the right. Fig 4. 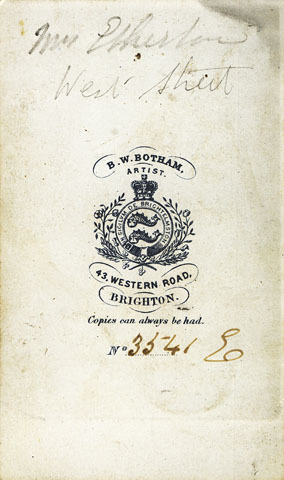 The trade plate used by B. W. Botham on cartes produced at 43 Western Road between 1867 and 1868. A former design (incorporating the royal arms and Brighton's emblem of two dolphins) is now enclosed within an elaborate cartouche.